Last night I had an opportunity to attend the Spreenkler January meeting, to hear Milwaukee's Mayor Tom Barrett speak about his vision for sustaining creativity and innovation and answer questions at The Residences at Hotel Polomar's sales office. I wasn't intending on sketchnoting the event, as I'd left my blank Moleskine sketchbooks at home. However, I did have my Moleskine notebook and a G2 gel pen along, so I decided spur of the moment to see what would happen. 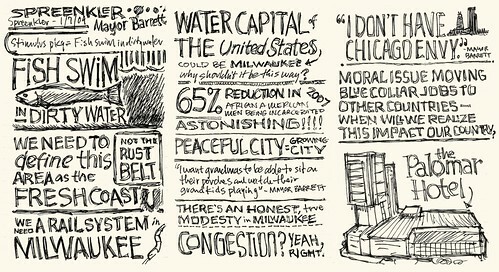 Turns out that Mayor Barrett had some great things to say, which I was able to capture in sketchote form, shown above. Thanks go to Steve Glynn for starting up Spreenkler to give Milwaukeeans more opportunities to connect and generate excitement in the city and this area, and to Mayor Barrett for speaking and taking questions.